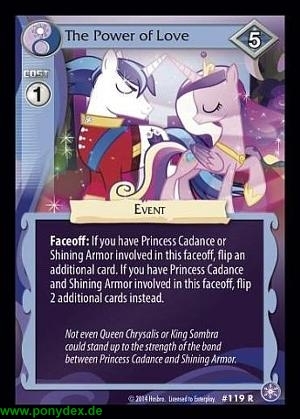 If you have Princess Cadance or Shining Armor involved in this faceoff, flip an additional card. If you have Princess Cadance and Shining Armor involved in this faceoff, flip 2 additional cards instead. Not even Queen Chrysalis or King Sombra could stand up to the strength of the bond between Princess Cadance and Shining Armor.